I recently visited Write of Passage, which is a six-week educational program and exhibition curated by Sacha Jenkins that explores the impact of American graffiti art on global culture. During my tour I met graffiti legend Chris “Daze” Ellis, who allowed me to interview him about another graffiti legend, Martin Wong. While Wong is well-known in the art world as an artist, he was not a graffiti writer, preferring instead to play the role of collector and archivist of a movement that would transform urbanscapes around the world. 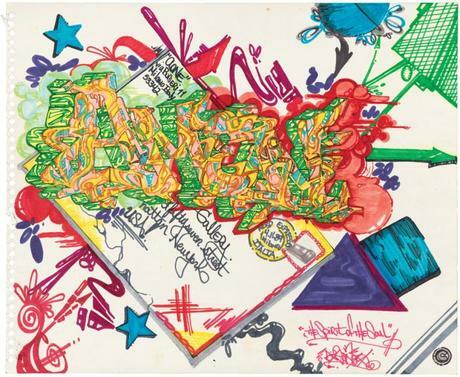 Wong’s collection, which was donated at the Museum of the City of New York (MCNY) after he died (no other museum wanted it at the time), is currently featured in a new publication by the institution, City as Canvas: New York Graffiti from the Martin Wong Collection. Made up of 300 objects, including some 50 artists’ black books, roughly 100 canvases, and over 150 works on paper, the MCNY’s Wong collection is an important and curious window into a period where people still debated graffiti’s lasting impact on American and world culture.